Volkswagen relies on Enterprise Architect along with bespoke LieberLieber modeling assistants to clearly and precisely communicate its requirements on infotainment software and systems development to its suppliers, and can now move ahead with plans to develop its own in-house infotainment software in the future. As part of Strategy 2025 it was also noted that, as the number of digital and software-based components in vehicles increases, customer satisfaction with these components is also becoming increasingly important. While VW intends to become one of the best companies in the world when it comes to user experience, since an almost countless number of suppliers actually work on a car, it is first necessary to optimize the communication with them and be able to clearly convey to them the requirements on new systems under development. A complex function such as voice control is distributed across the entire system and should operate without error at all times. Therefore, every supplier must know very precisely how the system should ultimately function. Previously, these requirements were only depicted in graphical form, but this is no longer sufficient. “We work with a wide variety of suppliers, all of which must receive our requirements in a homogenous and easily understandable form. This is the only way we can ensure that the often very complex functions always create an optimal user experience. This can no longer be guaranteed with traditional methods, but only by way of model-based development,” says Gollwitzer. Enterprise Architect from Sparx Systems has been in implementation at VW for some time, but until now has not seen widespread use. “Enterprise Architect is a powerful tool for model-based software and systems engineering, but due to its complex range of functionality it has been applied only in limited scope. We were therefore very happy to have gotten to know LieberLieber about one and a half years ago, a seasoned expert able to adapt the tool for our purposes with specific modeling assistants,” says Gollwitzer. The structure of the models to be developed was defined in joint meetings. To help developers comply with this structure, LieberLieber developed two “digital modeling assistants” (extensions for Enterprise Architect) and a tool for importing data formats such as JSON (data format for data exchange between applications) into Enterprise Architect. On the one hand, the two LieberLieber modeling assistants support the developers in the area of technical architecture, and on the other hand when it comes to the functions. Within the department, so-called “functional owners” are always defined for the functions to be developed, who must transmit the corresponding requirements to the suppliers as precisely as possible. “Thanks to the LieberLieber modeling assistants, the necessary steps in Enterprise Architect are clearly mapped out and supported automatically. This means that the tool and the method are now finding much more acceptance,” says Gollwitzer. While the purely graphical requirements define the basic structures, the suppliers are also given so-called sequence diagrams that define functional behavior. These describe the desired function in clear detail so that there are no misunderstandings. The Sequence Editor developed by LieberLieber supports the developers in creating and editing sequence diagrams automatically by means of a suggestion list. 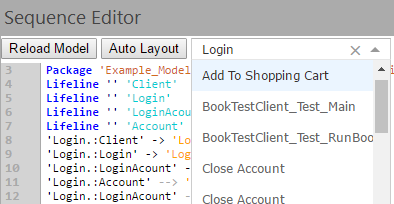 It also reports input errors interactively and displays the changes in the code in a separate window. “The digital modeling assistants very specifically limit the great possibilities of Enterprise Architect while accelerating error detection and data exchange. This makes the step into the new technology of model-based development much easier for us. On this basis, it seems quite feasible for us to create more software in-house,” emphasizes Gollwitzer. As a systems architect he is well aware that the biggest hurdle in dealing with a new methodology is its acceptance in order to achieve the desired model structure. For this reason, the corresponding introductory steps can only be implemented slowly in day-to-day production. However, once successful, hundreds of developers could realize maximum benefit from the new approach. The Sequence Editor is an extension created by LieberLieber for use with Sparx Systems Enterprise Architect. It is used to create and edit sequence diagrams in text form, which clearly describe the requirements for the system to be developed to the supplier. The package scope defines the packages used by the editor to search for lifeline classifiers. All instantiable elements (actors, classes, components, etc.) within the defined scope are offered in the next step for the creation of lifelines. The automatic completion lists all possible packages. Entering additional characters restricts the proposal list. The corresponding list entry is transferred by tab key or mouse click. As long as an input line is not syntactically correct, it is marked red. The diagram is updated after entering each correct line of code. The possible messages between the lifelines are offered in the proposal list. 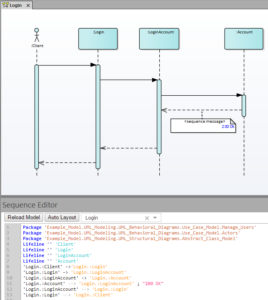 With the help of the LieberLieber Sequence Editor a sequence diagram is generated. In addition to lifelines, actors and sequence messages, sequence response messages are also generated that additionally describe a return message with an HTTP response code. Finally, the diagram elements can be placed as desired. Only sequence diagrams are offered in the selection list. It allows switching between the sequence diagrams of the model. The VW Group comprises twelve brands from seven European countries: Volkswagen Passenger Cars, Audi, SEAT, ŠKODA, Bentley, Bugatti, Lamborghini, Porsche, Ducati, Volkswagen Commercial Vehicles, Scania and MAN. The Volkswagen Group also offers a broad spectrum of financial services. These include dealer and customer financing, leasing, banking and insurance business and fleet management. With its program “TOGETHER – Strategy 2025”, the Volkswagen Group has cleared the way for the biggest change process in its history: the realignment of one of the best automotive companies into one of the world’s leading providers of sustainable mobility. To this end, the Group will transform its automotive core business, including the introduction of more than 30 additional all-electric models by 2025 along with the expansion of battery technology and autonomous driving as new core competencies. We are a software engineering company. The know-how of our employees lies in model-based software and system design based on tools such as Enterprise Architect from Sparx Systems. Our customers are companies that place particular importance on the quality of their software and systems development. They wish to maintain a constant overview of their complex development scenarios while ensuring that security-relevant requirements are clearly represented in models. For this task we provide our own special tools, such as LemonTree and Embedded Engineer. In addition, we offer a range of useful tool integration services to help make our customers' development processes more productive. To be honest, there is currently no plan to release it as product. Any plans to release the Sequence Editor tool?